Well it’s us again with our second tasting done at Nicola’s on Wednesday 2nd December 2009, as I said earlier, this month has started off so well indeed. Our second tasting tonight is a Bunnahabhain Whisky – Darach Ur. an Islay Malt, Jim and Dougie are certainly looking forward to this one. The beautiful Island of Islay, also known as the Queen of the Hebrides, lies off the west coast of Scotland. With 8 working whisky distilleries, the stunning scenery, amazing wildlife and all the friendly people, Islay is a five star holiday destination. Bunnahabhain Distillery has sat proudly on the northern shore of Islay for over 125 years, quietly making a distinctly gentle single Islay Malt Whisky. Darach Ur is Scots Gaelic for ‘new oak,’ and this latest travel retail release from the Islay Distillery of Bunnahabhain and contains Whiskies up to 20 years of age, all matured in new oak barrels, sourced from a cooperage in Kentucky, U.S.A. The Whisky Boys know this great Distillery well as we have visited it on every trip to Islay we have made, and that is many. 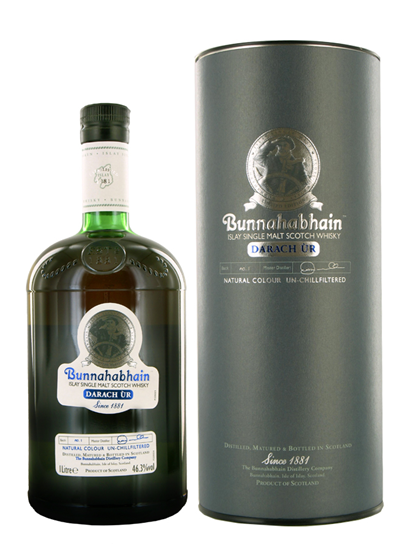 Bunnahabhain Islay Single Malt Scotch Whisky Darach Ur 46.3 Alc/vol. Nose…Certainly wakens up your nose with sweet seashore. Taste…Oaky and vanilla spice with dried fruit, the mild side of Islay, ever so smooth and gentle. Nose…Oaty, topped with sugar crystals. Taste…Porridge oats with sea salt as a topping. Finish…Short to medium, enjoyable and waiting for another. Nose…Fresh vanilla and malt with a hint of hazelnuts. Taste…Well rounded and mellow oak, spicy tingle with vanilla and salt. Finish…Medium to long, liquorice with burnt toffee and salt. Well Islay did not let us down again, how do they do it, time after time they produce a grand dram, and this one is no exception. Jim and his wife Jacqueline are having a weeks break at the end of February 2010, and guess where to, yes, Islay and based at Port Charlotte Hall, so all distileries on Islay will have to get another visit, what a hardship this will be. The only downside for our readers on this tasting is that you can only buy this dram at travel outlets and in 1 litre bottles, so if you are flying in or out of the country treat yourself to a bottle you will not be disappointed we can assure you. 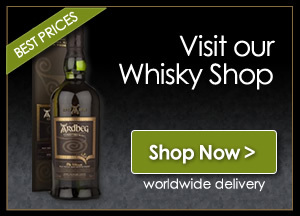 if you go and buy from The World of Whisky at the airports let them know that the Whisky Boy’s sent you. Well this is the second bottle from Nicola’s visit to Las Vegas, but Jim and Dougie know that she did bring back 5/6 bottles, so hopefully we shall get a chance to taste these, whatever they are. Happy dramming to you all.